Giant illuminated bunnies, designed by Australian artist Amanda Parer, will join the installation next Saturday, Feb. 27 through March 6. The Yards Park at D.C.'s Southeast Waterfront is glowing during a two-week-long light-themed art installation. Melding light, sculpture and music, the installation will officially kick off Saturday with a large-scale projection mapping a visual display set to the beat of a live DJ set from 7 p.m. to 10 p.m.
White light sculptures named Point Cloud and Cube, constructed by New York architect and light artist John Ensor Parker, will be the focal point of the event and will remain throughout the two weeks. 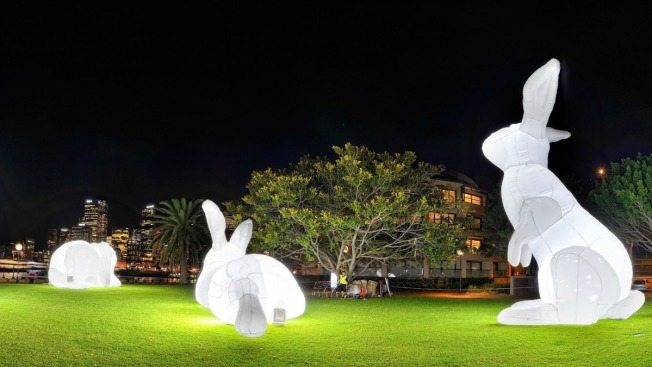 Giant luminescent rabbits designed by Australian artist Amanda Parer will be joining the display on Saturday, Feb. 27. To kick off Parer’s U.S. tour, families are invited from 3 p.m. to 6 p.m. to see the glowing bunnies while enjoying children’s activities, including a giant Lite-Brite. From 6 p.m. to 10 p.m., the Yards Park will blend music and art with a performance by electric violinist DJ Manifesto. Food and beverage will be available for purchase during the special events Saturday and Feb. 27. Light Yards is a free event, and cameras are allowed. The installation closes March 6.